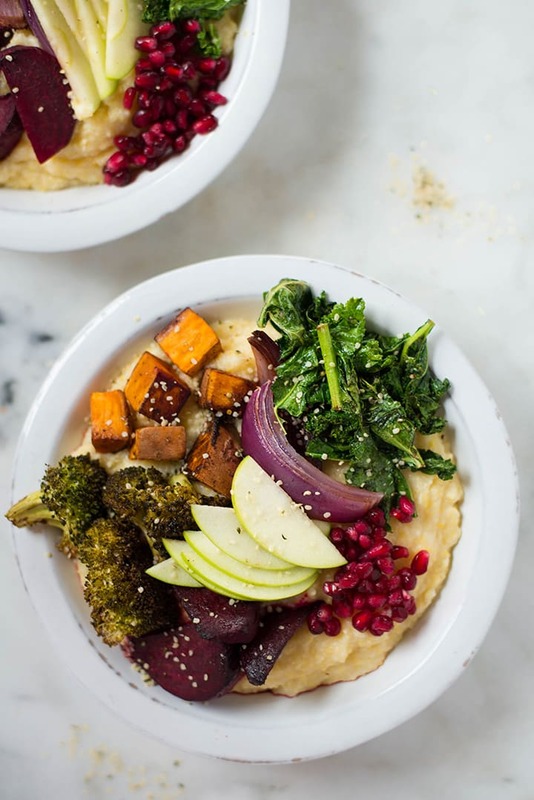 This healthy harvest bowl recipe has roasted fall veggies nestled atop creamy polenta (with hidden cauliflower for less calories and more nutrients! ), then complimented with garlic sautéed kale, crisp green apple slices, vibrant pomegranate seeds, and hemp seed hearts. OMG this harvest buddha bowl is ALMOST too good to be true! This post is sponsored by Cristel USA. 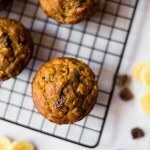 Let’s start things off with a quick discussion about healthy Fall recipes. What are your favorite seasonal ingredients to use in Fall recipes? I’m guessing most everyone loves a little bit of pumpkin spice during Fall. Personally, I’m a fan of it ALL. I know: shocking, right? I’ll take some squash…whether it’s roasted acorn squash, butternut squash bisque or acorn squash soup. Plus sweet potato dishes. Also pumpkin in pumpkin pie, pumpkin bread, pumpkin pancakes. Pumpkin in… (almost) everything. Am I right? But the list of Fall ingredients doesn’t stop there. There are so many delicious Fall ingredients and it’s super hard to decide which Fall flavor to use and which one to leave out of your Fall recipes. Fortunately, I have good news for you! Sometimes it’s better to combine your favorite Fall flavors, rather than choosing your favorite one. The best way to do it is by making Fall bowls. Pretty, colorful, healthy, and delicious Fall bowls filled with seasonal fruits and veggies. Making such a Buddha bowl is super easy, thankfully. And Buddha bowls are always so darn healthy. So, to keep things fresh and seasonal, I decided to make a harvest bowl. The concept is very simple. And so are the ingredients. 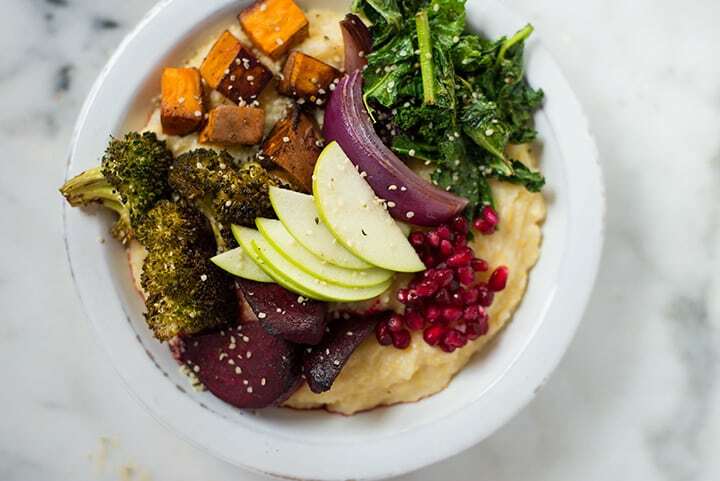 Here’s how it goes: You start off your bowl with a creamy cauliflower grits base and then top it with roasted veggies, sautéed kale, crisp sliced apple, hemp seed hearts, and pomegranate seeds. Hello, lover. 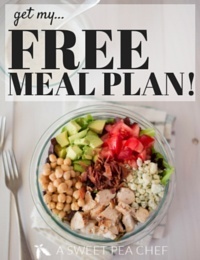 What you get is a ridiculously healthy meal loaded with vitamins and nutrients from all the veggies and fruits. And Fall flavors. <— LOVE! Do you feel like this harvest bowl recipe is calling your name? I think it does. And I think you should answer with a big YES. SO…WHAT IS A BUDDHA BOWL? 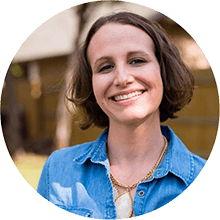 Wondering what is a Buddha bowl? 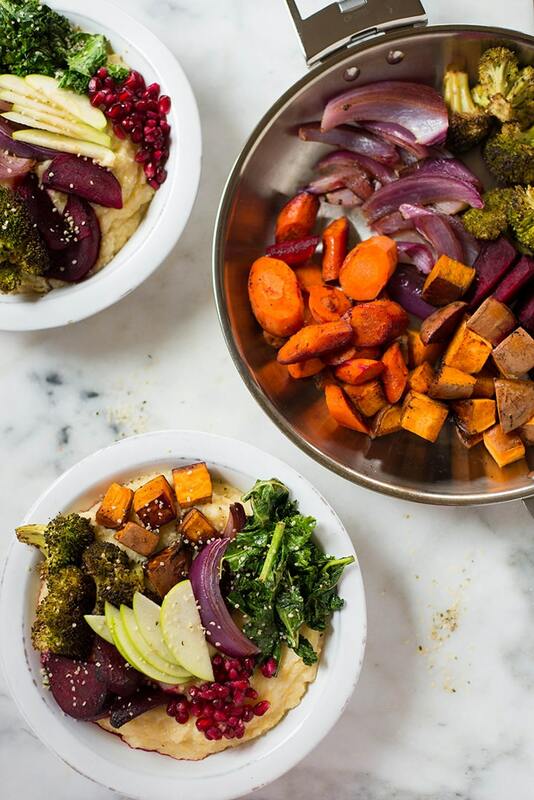 A Buddha bowl is a big bowl of food that usually includes a mix of roasted veggies, raw veggies, grains, and nut or fruit toppings. 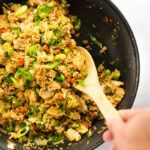 Basically, a Buddha bowl is a versatile dish you can easily enjoy on the go or at home, on its own or paired with protein. 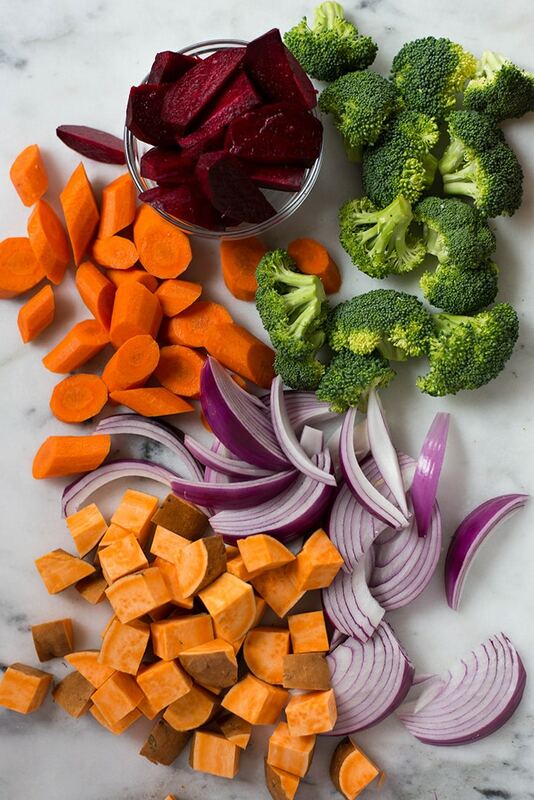 In this case, our beautiful Buddha bowl is a vegetable bowl filled wonderful Fall flavors and textures. Hence the name. I also like to call this a harvest bowl because its colors remind me of the harvest season. Sounds like your type of meal, no? If you answered yes to my previous question, then, I have two things to share with you. One: You rock (duh!). And two: I’m betting you want to learn more about this harvest bowl recipe. Am I right? Perfect. Don’t worry, I’ll discuss in detail every step listed here to make sure your first harvest bowl turns out perfectly. Grits are such a favorite in the South. I mean — gah — they’re creamy, smooth, savory, and luscious…whats’s NOT to love, am I right? Well, how about the fact they are high in saturated fat because most grits have lots of added butter, cream, and cheese? Boo. While that makes them taste creamy, it’s definitely not that great for our bodies. But, can I let you in on a little secret? 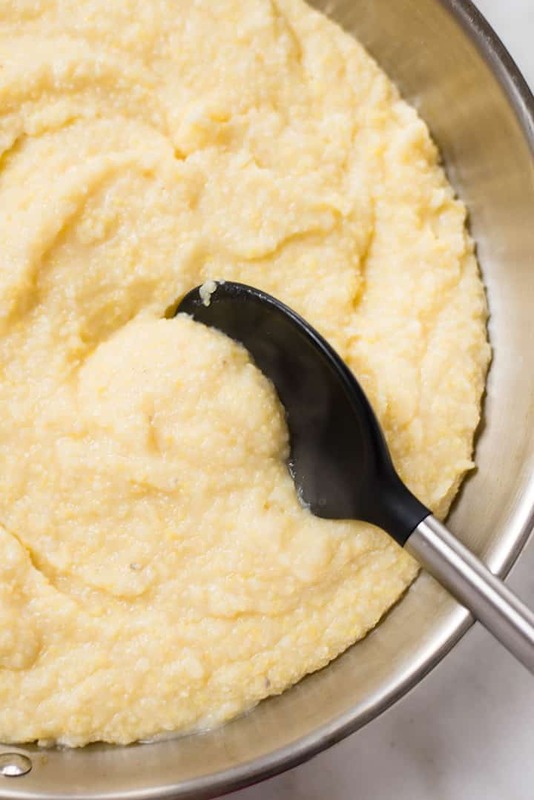 Adding pureed cauliflower makes your grits taste super creamy and luscious — no butter, cream, or cheese needed! cover the cauliflower florets with vegetable broth. cook the cauliflower for approximately 15-20 minutes or until the florets are tender. transfer the florets to a blender and blend until smooth. set the cauliflower aside and start working on the grits. in a saucepan, heat water, and milk until simmering. cook until the texture is thick and the grits are tender. This usually takes 15-20 minutes. season with sea salt and garlic powder. The base for our harvest bowl is now done. 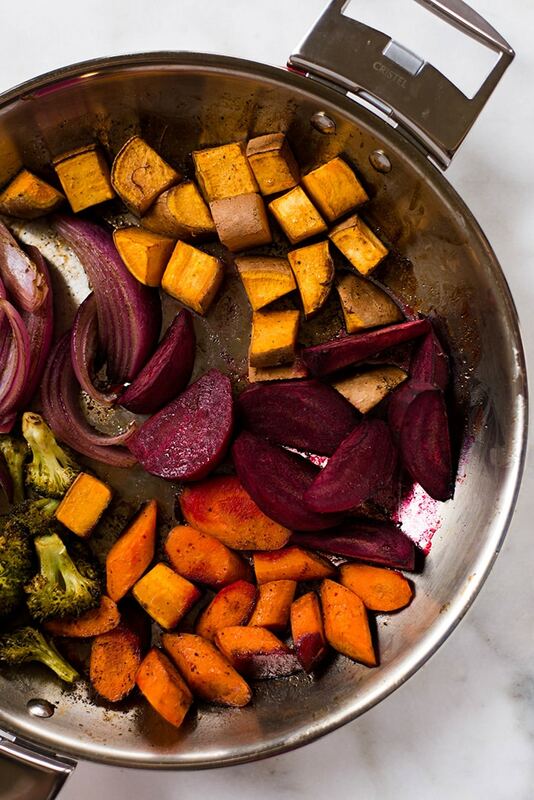 Time to talk about how to roast vegetables in the oven. roast in the oven until tender. This should take 20-30 minutes. 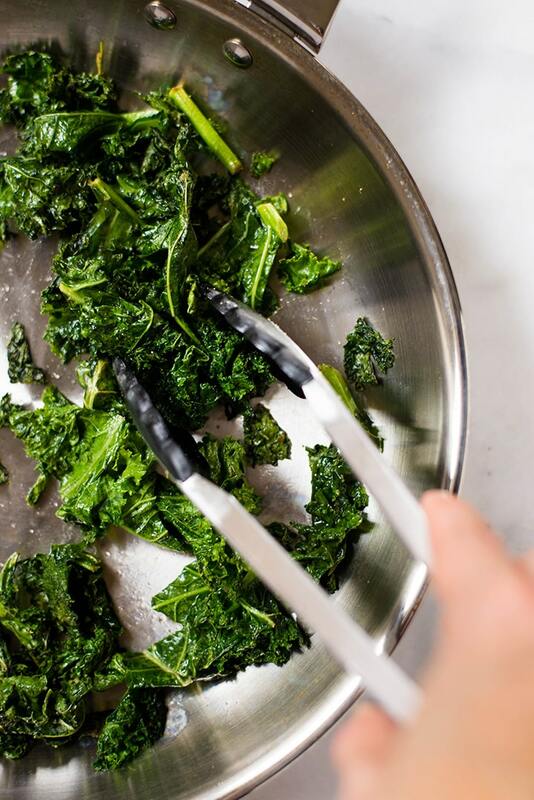 Don’t know how to sauté kale? It’s super-duper easy. Like so easy you’ll wonder how you’ve never tried it before. toss for one more minute. Putting the harvest bowl together is my favorite part. Because it’s the last one. Which means I’m close to enjoying the goodness and awesomeness of this harvest bowl. So exciting! So much deliciousness to enjoy in one bowl. I mean, look at it…. 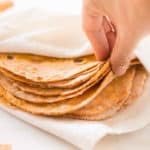 I want you to make the best out of the glorious Fall produce so I have 3 other healthy fall recipes I think you should try. 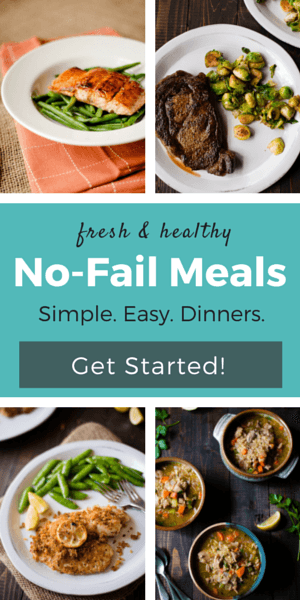 These Fall recipes are exactly what you expect of them: healthy, flavorful, and totes amazing. 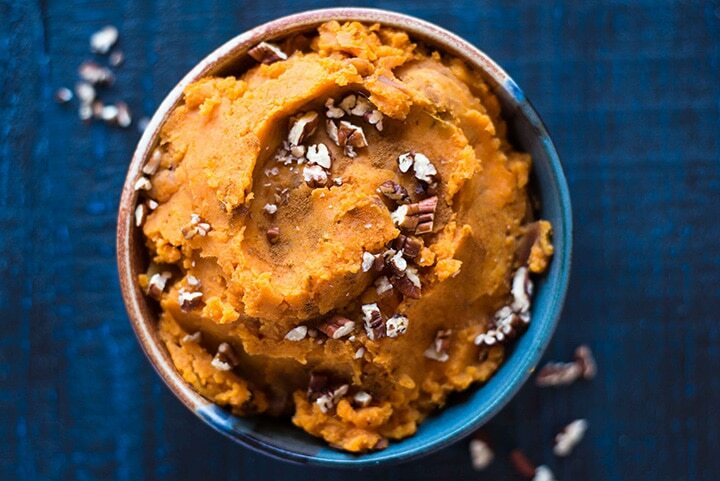 My first recommended Fall recipe, other than the harvest bowl, of course, is this 3-Ingredient Healthy Mashed Sweet Potatoes. As the titles say, the recipe requires only 3 ingredients – maple syrup, cinnamon, and sweet potatoes, obviously. We’re talking about a vegan and refined sugar-free recipe over here as you can see. Woot. Get the recipe. 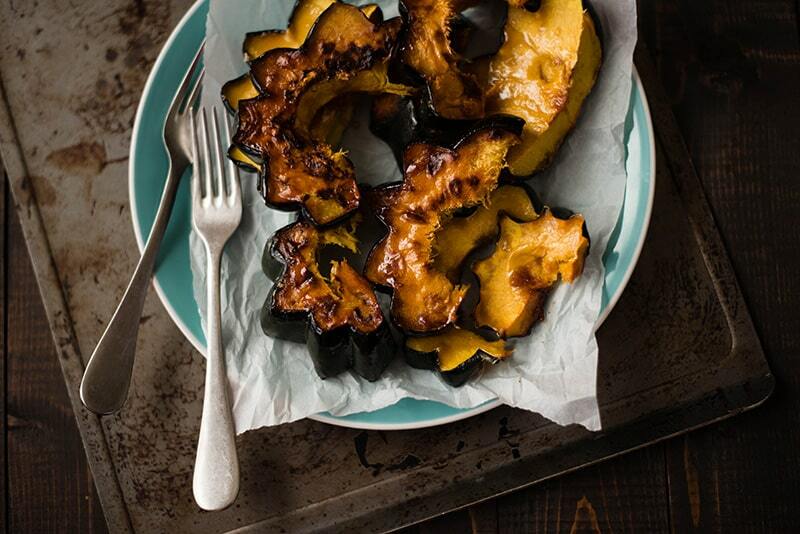 Learn How to Make Roasted Acorn Squash and cook a sweet and delicious Fall treat for you and your family. 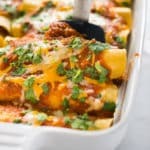 This is another 3-ingredients recipe. Also another refined-sugar free one. But the acorn squash is still sweet and delicious because the recipe uses coconut sugar. Yummy, right? Get the recipe. Meal prepping is such a time savior. 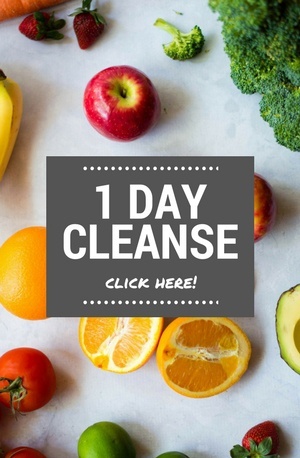 And perfect for those who want to be sure they never cheat their healthy diets. So is grilling. You know what’s coming, right? Fall Meal Prep on the Grill! 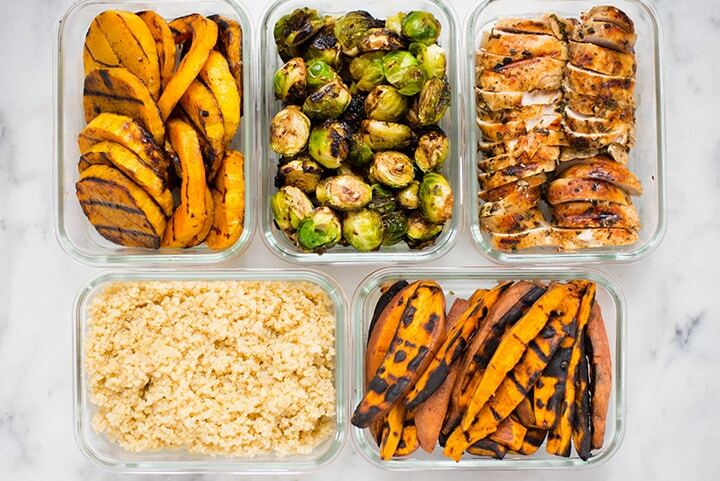 With this grilling guide post you’ll learn how to grill veggies, how to prep delicious grilled chicken, and how to put together high protein, high fiber, and nutritious meals for the entire week. Get the recipe. 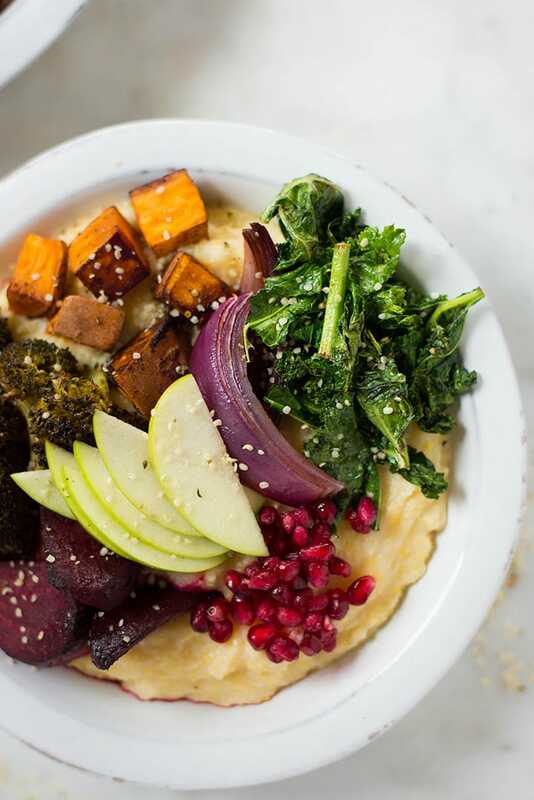 This healthy harvest bowl recipe has roasted fall veggies nestled atop creamy polenta (with hidden cauliflower for less calories and more nutrients! ), then complimented with garlic sautéed kale, crisp green apple slices, vibrant pomegranate seeds, and hemp seed hearts. 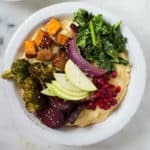 OMG this harvest buddha bowl is ALMOST too good to be true! 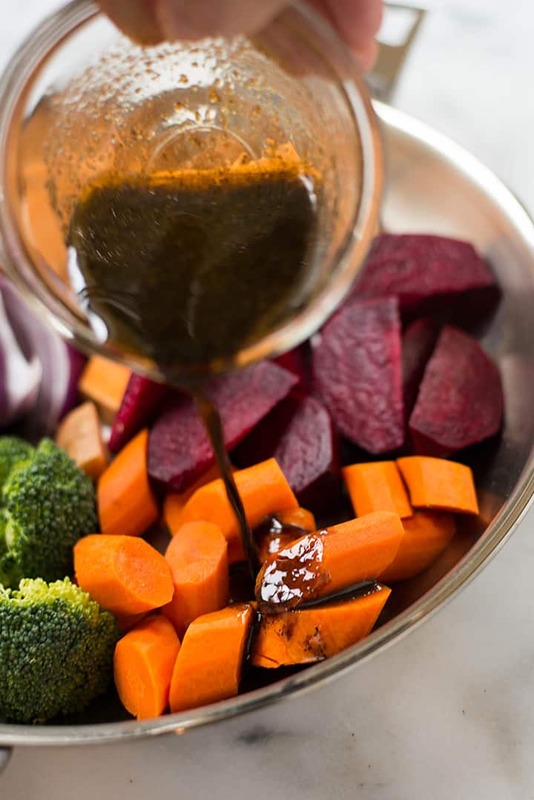 Combine olive oil, balsamic vinegar, sea salt, and pepper together and then drizzle over the veggies. Toss to coat. If using a Cristel oven-safe fry pan, sear the veggies over high heat for 3-5 minutes, then transfer to oven to finish. If not, use a rimmed baking sheet lined with parchment paper. Roast in oven for 20-30 minutes, or until veggies are tender. Add the cauliflower florets to a sauce pan and cover with 2 cups of the vegetable broth. Cook, covered, for 15-20 minutes, until the florets are tender. 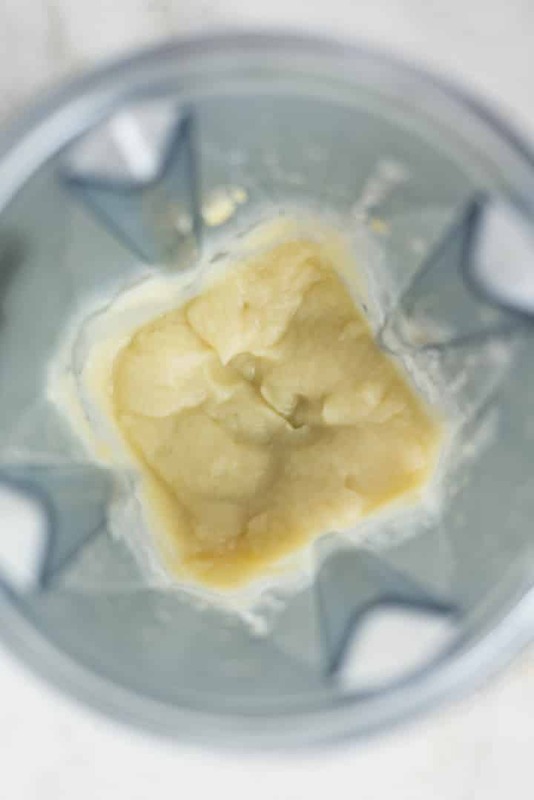 Transfer the cooked cauliflower and any leftover liquid to a blender and puree until smooth. Set aside. Heat the remaining 2 cups vegetable broth and milk in a sauce pan over medium-high heat until simmering. Stir grits into the simmering broth and milk. Cook, stirring frequently, until the grits are tender and the texture is thick, about 15-20 minutes. Add in the pureed cauliflower, sea salt, and garlic powder, and stir until combined. To make the kale, heat the olive oil over medium heat in a skillet. Add the kale and seasoning and sauté until softened. To serve, add the cauliflower grits to a bowl. Top with roasted veggies, sautéed kale, pomegranate seeds, hemp seed hearts, and sliced apple. 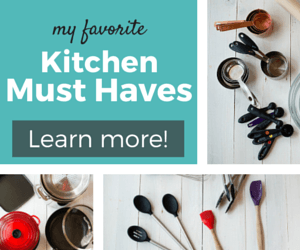 This post contains affiliate links for products I use often and highly recommend. This post is sponsored by Cristel USA. *It is NOT the butter, cream, and cheese that make grits unhealthy, it’s the gmo-ridden and (too) high in carbohydrates CORN!